Delecta Ltd (ASX:DLC) is in a transitioning phase as it aims to diversify its operations and capitalise on the demand for battery minerals. With this in mind management has entered into a binding option agreement to acquire a 100% interest in the high-grade Highline Cobalt-Copper Project, located in the State of Nevada, USA. The Highline acquisition is part of Delecta’s diversification strategy aimed at capitalising on the demand for battery minerals such as Cobalt, Lithium and Vanadium, which has seen the rapid rise in the LME price of Cobalt (from US$23,000/tonne in March 2016 to US$63,750/tonne in August 2018). The key commercial terms of the option agreement include a cash payment of $100,000 and the issue of 10 million fully paid shares in Delecta for a 90 day exclusive option period. Upon exercise of the option, Delecta can choose to complete the transaction by paying $150,000 in cash and issuing 50 million fully paid ordinary shares in the company with an escrow period of six months. It is worth noting that this acquisition complements a direct investment by Delecta in the battery minerals sector, as the company has leverage to lithium through its shareholding in European Lithium Ltd (ASX:EUR). Highlighting Delecta’s decision to focus on the battery minerals space, managing director Malcolm Day said, “Given the Delecta’s success with its investment in European Lithium Ltd (share price up more than 200% year-on-year), the company has continued to seek and evaluate other investment opportunities in the battery minerals space. 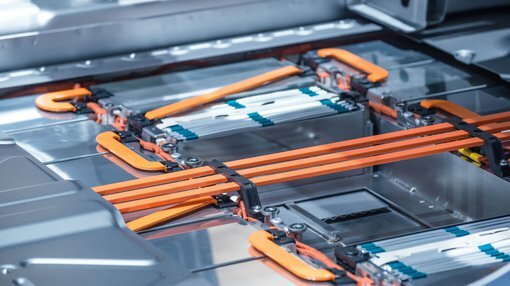 “The increased demand for battery minerals, like lithium and cobalt, is primarily due to the rapid advancement and demand for electric vehicles. However, this is a very early stage play and investors should seek professional financial advice if considering this stock for their portfolio. The Highline Project comprises five patented mining claims totalling 90.4 acres located within the Goodsprings mining district in southern Nevada, 48 kilometres southwest of Las Vegas and approximately 3 kilometres south-west of the town of Goodsprings, Nevada. The claims are readily accessible via the interstate route from Las Vegas to Los Angeles. Located in the Springs Mountains the topography is mountainous, but access is good owing to the numerous tracks in the area. The project to be acquired is surrounded by four historical cobalt mines, and neighbours include the ASX-listed New World Cobalt (ASX:NWC) and Tyranna Resources (ASX:TYX). Both have aggressive exploration programs planned for the next six months on their respective projects. Less than a kilometre away is the New World Goodsprings Copper-Cobalt Project, now owned by New World Cobalt. It also boasts a rich history which dates back nearly a century when three parcels of cobalt ore were mined and sold, with individual ore parcels grading 29.18% cobalt, 13.42% cobalt and 5.13% cobalt. Historical records report that by the end of 1962, the Goodsprings District had yielded 109,000 tonnes of zinc, 47,000 tonnes of lead, 2,500 tonnes of copper, 90,500 ounces of gold, 2.1 million ounces of silver and 5.5 tonnes of cobalt. 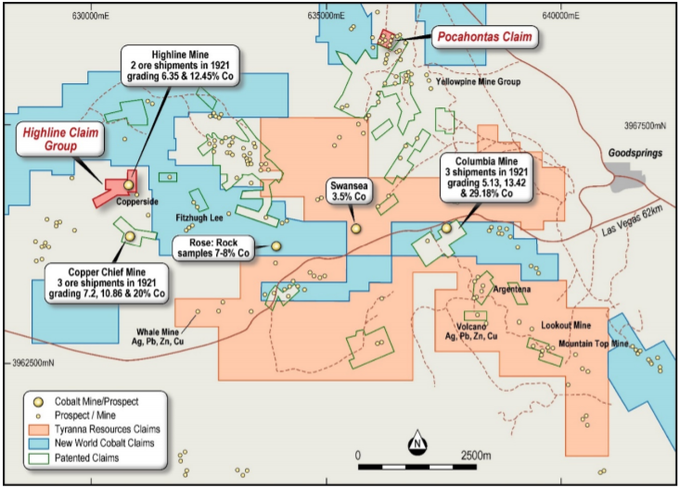 The Highline claim group themselves are recorded as having been mined between 1917 and 1921, producing 132 tonnes of copper from 477 tonnes of ore at an average grade of 35%, the highest grade in the district. Two separate lots of cobalt ore from the dump weighed in at 2,190 kilograms and 545 kilograms, returning impressive grades of 6.35% and 12.45% respectively. Due to the lack of any modern exploration, the project area presents very attractive opportunities to deploy modern exploration techniques which Delecta is planning to commence as soon as the option agreement is executed.